Succession of the spirit of the Jeju 4•3 uprising! ‘Workers’ Peace Cultural festival,’ March 30, 2013. It has been more than a decade that the Korean Confederation of Trade Unions visited the Island for the remembrance of 4•3 every year. It was this year, too. 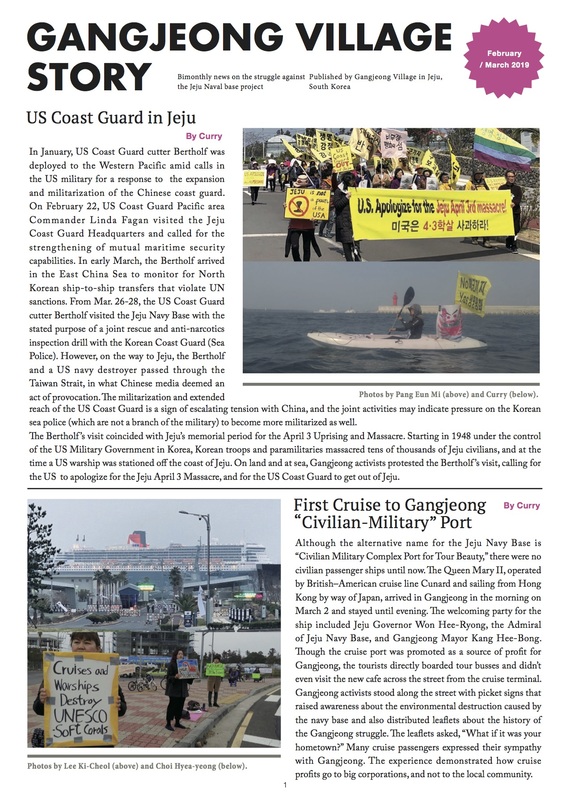 And it has been years that the organization visited the Gangjeong village to express their support and solidarity to the people there in opposition to the Jeju naval base construction. The workers are aware that Gangjeong is the very site of the 2nd 4•3. ‘The Jeju 4.3 uprising is the Jeju Island people’s resistance and uprising that occurred by the starting point of police firing incident on March 1, 1947 under the division and U.S. Army Military Government ruling after the liberation of Korea. Since the armed group of the Jeju branch of the Workers Party of South Korea rose up on April 3rd, 1948, numerous people were sacrificed in the Jeju Island during the process of armed conflicts between the armed group and subjugation army and of the latter’s subjugation process, until the restriction areas in the Halla Mt. were totally opened on Sept. 21, 1954. This year when the Cease Fire Agreement of the cold war and confrontation system hits 60th anniversary, and today when war crisis is higher than ever in the Korean peninsula, along with the above, we are to gather the workers’ resolution to succeed the spirit of the Jeju 4•3 people’s uprising and to realize complete peace and homeland unification. Stop the oppression on the unions! Abolish the structured lay-off on the irregular workers! 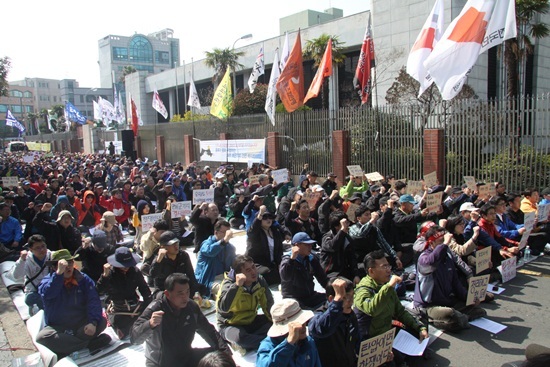 Total revocation of the Jeju naval base project! 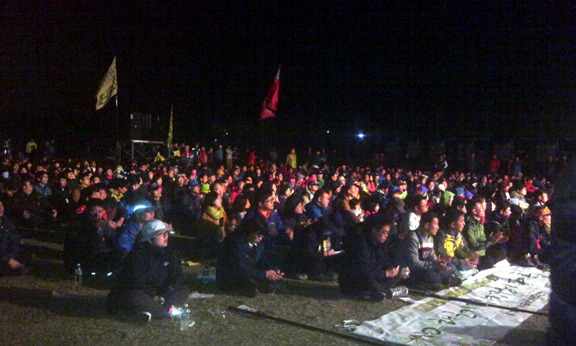 Image source: Sisa Jeju, March 31/ In his solidarity speech, Mayor Kang Dong-Kyun stated that even though 65 years have passed since the occurrence of the Jeju 4•3, state violence is continuing and the Jeju naval base project, so called a national security policy, is being enforced without people’s support. 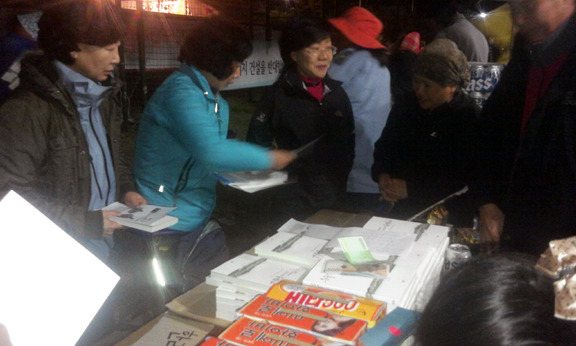 The people in Gangjeong raised some struggle funds by selling books to the workers. The book, titled, “Peace blossoming in Tears,” published last year, is on the 17 villagers’ life stories written by 17 writers. It is a great book that helps people understand the life and struggle of the villagers.